Scientists used a mathematical approach to uncover path-defining “structures” beneath Gulf waters that governed the movement of oil following the Deepwater Horizon oil spill. They published their findings in the March 2012 edition of the Proceedings of the National Academy of Sciences: Forecasting sudden changes in environmental pollution patterns. This method could give decision makers quick and reliable information to support evacuations, interventions for marine life, and use of dispersants. Researchers analyzed Lagrangian coherent structures (LCSs) to identify below-surface pushes and pulls – in place of traditional weather forecasting models – that created “major short-term changes” to the flow of water and influenced the movement of dispersed oil. Analysis of LCS, “the recently discovered hidden skeleton behind complex mixing patterns in unsteady flows,” uses immediate information about velocity of water flow or air circulation rather than the computer-generated models of weather used by scientists and responders in 2010. In the summer following the spill, researchers observed that “uncertainties in the spread of the pollutant plume had severe financial implications,” and reduced the effectiveness of response efforts. 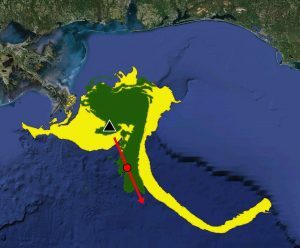 (Click to enlarge) This image incorporates LCS-core analysis data (in red) onto a simulation of the oil slick (in green) following the Deepwater Horizon oil spill. 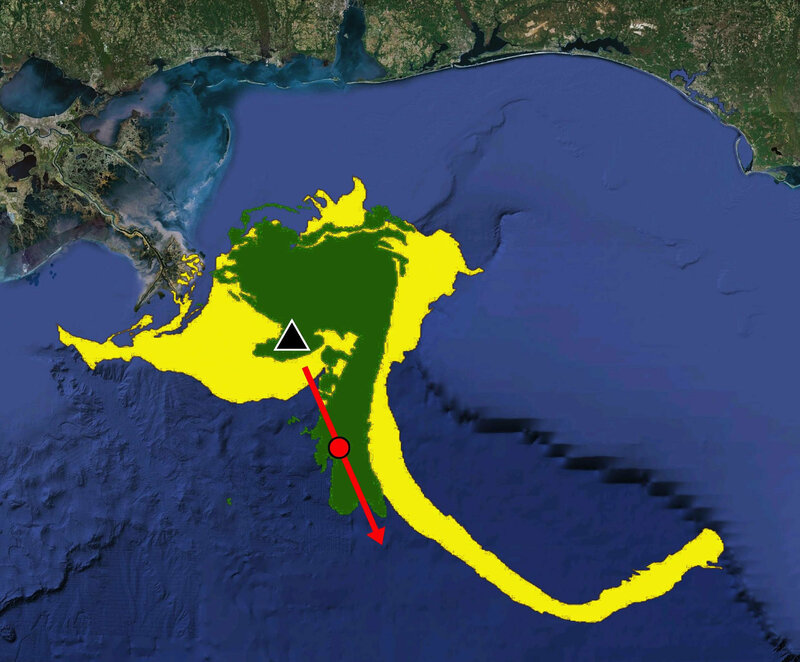 Data from the LCS-core analyses forecasted the subsequent formation and movement of the oil slick (in yellow) sometimes referred to as the “tiger tail.” Image by Dr. Maria Josefina Olascoaga. Data acknowledgement to Geoffrey Samuels and the Center for Southeastern Tropical Advanced Remote Sensing (CSTARS) in Miami, FL. With LCS analysis, scientists were able to “obtain remarkably accurate predictions of instabilities in the shape of the spill.” The scientists envision broad applications of LCS-core analysis in making predictions for other environmental pollutants in the air (such as ash clouds) or water (such as red tides), potentially reducing ecologic and economic impacts. Increased accuracy in forecasts of the paths of contaminants in water or air can help in decision making, resource allocation, model validation, and scenario analysis. The study authors are María J. Olascoaga and George Haller (Proceedings of the National Academy of Sciences 2012: 1118574109v1-6). 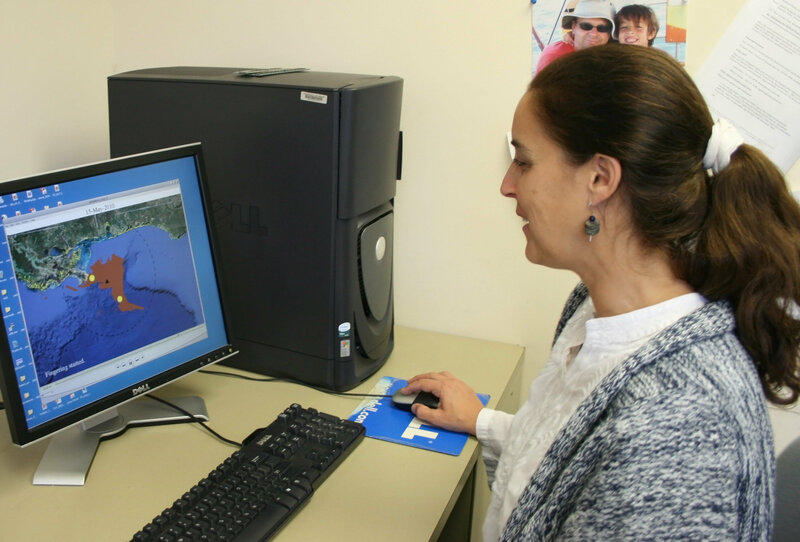 This research was made possible in part by a Grant from BP/The Gulf of Mexico Research Initiative (GoMRI) through the Consortium for Advanced Research on Transport of Hydrocarbon in the Environment (CARTHE). Other funding sources included the National Science Foundation CMG0825547 and OCE0432368/0911373/1127813, National Institute of Environmental Health Sciences P50 ES12736, and the National Aeronautics and Space Administration NNX10AE99G.